Repairing Shower Leaks - Armchair Builder :: Blog :: Build, renovate, & repair your own home. Save money as an owner builder.- Armchair Builder :: Blog :: Build, renovate, & repair your own home. Save money as an owner builder. 0 Comments | Posted by armchairbuilder in Bath Remodel, Fix it! with water only to notice water leaking down to the ground. The marble is not cracked. I believe the leak is going through the slices of the marble floor. Just imagine a 3 x 3 marble slab with 2 diagonal cuts and the drain in the center. I believe the water is going through the grout cracks. Unfortunately the pieces are very tightly put together minimizing the grout in between the pieces. Is there some type of seal that can be put on the whole surface to repair this leak. Your help in this problem is greatly appreciated. I would first check to see if the plumbing drain is leaking. You can do this by letting the shower dry out for a day. Then pour water down the drain only (don’t get it on the marble slabs) and see if any drips come out below. If you see drips below, it is a plumbing issue. After giving that some time to dry, try pouring water around the edges of the drain…where the drain meets the marble (but nowhere else)…then check again for any water drips below. 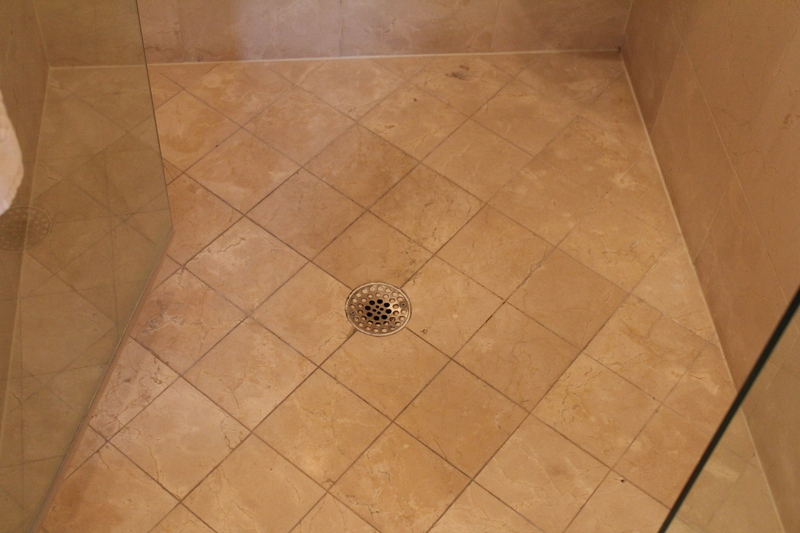 If you see water, it’s a seal problem between the plumbing drain and the shower floor. Your plumber can help with this. If you don’t see any water after these two tests, you know the leak is coming through the shower floor or walls. Obviously, you can tear apart the shower to see what the problem is. But are there any easy things you can try that might fix the problem before you tear it apart? One thing you might try is removing the top 1/8 inch of grout between the marble and replacing it with a high quality silicone caulk (mildew resistant)…making sure to push the bead of caulk completely into the grout lines and smoothing it out so it covers the complete crack. Follow the directions on the caulk for application and cure times and then try using the shower once it is completely dry. If you don’t see water, you’re good to go. If you still see water, it could be coming in from the edges of the floor or through the walls. Repeat the silicone caulk steps above at every joint between marble slabs. Then test again. One of the above items should fix the problem in 98% of the cases. These shower leaks can be prevented when proper installation methods are used. Check out our video below for some tips on creating a leak free shower on your new home build or bath remodel. And if you are thinking of building or remodeling your home, be sure to check out our owner builder resources that will help you save both time and money on your projects.